"PRESIDENT Emmerson Mnangagwa is in a catch-22 situation over whether to implement recommendations of the Motlanthe commission of inquiry into the August 1 post-election violence, which urged him to engage opposition MDC leader Nelson Chamisa to move the country forward," reported Newsday. Zimbabwe is in this economic mess of serious economic meltdown because it is in a political paralysis. Zanu PF has ruthlessly imposed itself on the nation as the only party to govern the country regardless of the party's performance. Yes Mnangagwa is caught in a catch-22 situation but one a lot more subtle than having a dialogue with Chamisa. He rigged the elections to return his strangle hold on power for absolute power's sake but also to make sure he and his fellow Zanu PF thugs are never held to account for all their past misdeed of looting, rigging elections, staging coups and mass murders. By rigging the elections Zanu PF was assured of the party's iron grip on power but it also forfeited the people's democratic mandate, making it an illegitimate regime. And, more significantly, by rigging the elections Mnangagwa has also confirmed that Zimbabwe is still a pariah state ruled by corrupt and vote rigging thugs. As we already know from Mugabe's years, no investor, foreign or local, likes to do business in a pariah state; it is too risky. The failure to attract investment is the root cause of the country's worsening economic meltdown. Inviting Chamisa and his MDC Alliance into the present government will not change the fundamental character of the regime; it will still be an illegitimate regime in power on the back of rigged elections. Investors are a shrewd lot, they will not be easily fooled by such a cosmetic change of adding Chamisa and a few other MDC Alliance members to the cabinet; they will continue to shy away from investing in Zimbabwe. Chamisa has promised economic recovery if Mnangagwa agrees to a GNU; this is one promise he will never keep. So Mnangagwa was damned if he did not rig the elections and so he did rig the elections. And having rigged the elections, now he is damned for it, by virtue of the worsening economic meltdown. As for us, the ordinary Zimbabweans, we have a tough but clear cut choice. Either we reward Mnangagwa for rigging the recent elections by allowing to rule and paid the heavy price of the worsening economic meltdown and the near certainty of political instability. Or we finally stand up to the regime and demand that it steps down. This will allow the nation to finally implement the democratic reforms necessary to fully restore our freedoms and human rights including the right to free and fair elections and the right to life itself. Zanu PF will resist this change. We must remember that after 38 years of rigging elections and getting away with it Mnangagwa and his Zanu PF junta now believe their have the right to rig elections and rule Zimbabwe with or without the people's democratic mandate. It is not in the nature of tyrannical regimes to give up their dictatorial powers. If we want our right to a meaningful say in the governance of Zimbabwe we must be prepared to fight for it. Anything in this life worth having is worth fighting for. It is not just our economic right to employment, to health care, etc. that is at stake here but our right to life itself and the very survival of the nation too! 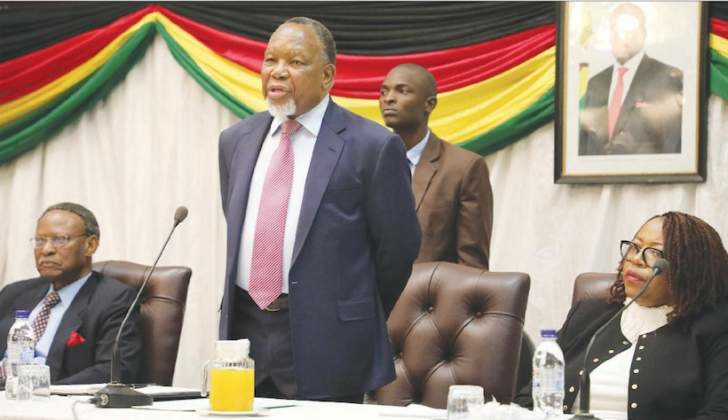 As much as former SA President Motlanthe and his fellow commissioners would like us to believe that the proposed GNU will "take the nation forwards"; we all know this is a lie. The GNU is just to appease Mnangagwa and his Zanu PF junta by giving the illegitimate regime some modicum of legitimacy. Zanu PF is imploding as the party members fight each other over power and looting rights like hyenas fighting over scraps. Zanu PF members' greed is insatiable, not even all the gold and diamonds in the world would satisfy them. It is therefore futile to keep on trying to appease them especially, as is the case here, at the expense of millions of ordinary Zimbabweans now living in abject poverty. The real challenge here is to stand up to Mnangagwa and his cronies and tell them that they cannot drag the whole nation into the abyss to gratify their greed for power and loot. Whilst we are still there, tell Motlanthe and his commissioners that it is unacceptable for them to sell us a false cure; they are trading bronze for gold!